The Falken RT615 has always been a good all-around Ultra High Performance dry weather tire with decent durability. Good enough to be daily driven and good enough for the track. The RT615 had excellent grip on the track but its main falling point was that it would overheat and start to grease out after a few hard laps and you lap times would suffer, you would then have to play a tire management game of not letting your tires get too hot. This would happen even when doing autocross hot lapping. If you continued to push the tires hard, the would sometimes chunk and develop blisters although this would take some ham-fisted driving to get the tires to go off this hard. To improve the RT615 Falken introduced the RT615K. Interestingly enough the K version of the tire was developed to make a more competitive tire for Pro Drifting, most notably Falken’s Formula Drift team. The goal was to produce a tire that could maintain the maximum grip possible without wearing out for Formula Drifts mandated 2 laps of any give drift course. 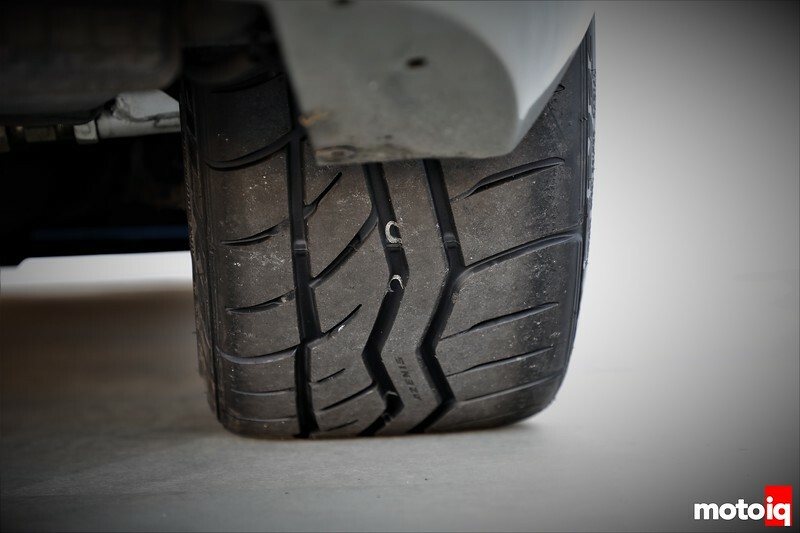 Falken wanted to address the blistering and chunking issues while providing consistent grip for the life of the entire tread down to the cords. Thus the RT615K was introduced 3 years ago as a running change. Basically, the RT615K was identical to the RT615 except for the tread compound and a few other minor changes to the carcass. The tread pattern is identical. We have been running the RT615 on Project GD STI for over 4 years since nearly the inception of the project and they have been holding up really well despite daily driving with an aggressive alignment with a lot of negative camber and doing a couple of track days. The tires had almost 30k miles on them when they gave up the ghost and suddenly wore through to the steel belts on the front. We were not bummed out as the tires had performed well over their entire life. The RT615K had also had a revamping a little over a year ago with a running change of the tread compound to once again improve grip while maintaining consistent traction for the life of the tread, again to try to stay competitive in Pro Drifting. Although the most current RT615K, the RT615K Plus, isn’t the most sticky tire in drifting, it is probably the most consistent and forgiving tire through the entire life of its tread. So a lot of what makes a tire good for high-level pro drifting applies to a performance tire as well. We obtained a set of the latest Falken RT615K Plus’s to replace the worn out 615’s on Project STI so we could do a back to back comparison between the two tires. We were especially wondering if the tires grip would not grease out as easily as before. 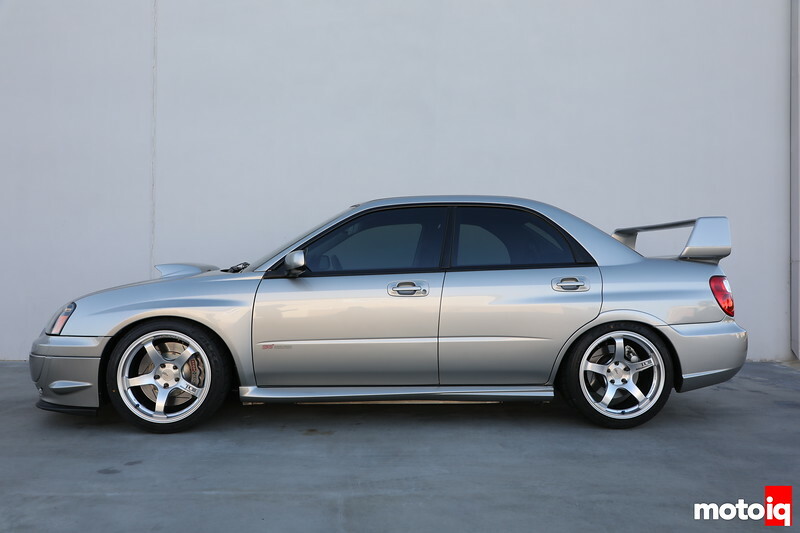 I own this exact car and have been using your STi as inspiration in modifying my own. But in this article it says “Advan TC III’s in 18×9.5 with a 40mm offset” and the fenders have been rolled!? typical with todays wanna be journalist/authors always publishing before proof reading. Everyone thinks they’re a journalist these days because they have a website. And everyone who is slightly capable of writing thinks that they can be a literary critic too! Mike any reason you went with 9.5″ wheels instead of 9.0″ to accomodate the 245 tires? I liked the way it looked ! I also want to experiment with a slight strech on a modern tire. Old tires with more flexible sidewalls would sometimes respond well to a minor stretch. My feeling is that current tires do not. Got it. On my Golf R I mounted 235 Michelin Cup 2 on Volk ZE40 8.5″ rims althoght 9″ rims were available but I didn’t want the extra width for extra rotational mass.